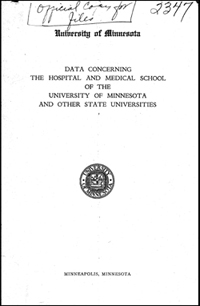 On July 27, 1926 then University of Minnesota President Lotus D. Coffman wrote a letter to Dr. H. M. Johnson, Chairman of the Committee of the Minnesota State Medical Association outlining the University’s business plan to put into practice the employment of full time clinical instructors and the use of the hospital facilities by private & per diem patients. Although the style of language for the most part reveals their age, read the following excerpts from the above two mentioned documents and see if you can guess their date of origin: 1926 or 2009. Enhanced ability to recruit and retain faculty and compensate them at a competitive market rate. 1926 or 2009? The problem of securing and keeping a staff of talented and enthusiastic teachers is one of the most difficult and continuous tasks that confronts any university. 1926 or 2009? Greater access to a larger population for participation in clinical research and to support the education of the next generation of health professionals. 1926 or 2009? The University here faces the practical necessity of providing enough hospital beds to insure those types of cases and diseases, and in sufficient numbers, that may be necessary for the education and training of those proposing to enter the professions of nursing and medicine. This is a great educational responsibility which the University cannot fail to discharge. 1926 or 2009? Enable the health professions of the AHC to achieve relevance, leadership and excellence into the 21st century. 1926 or 2009? Ambitious clinical and laboratory teachers will not associate themselves, even for high salaries, with an institution which cannot offer good opportunities for their continuing growth and intellectual development. 1926 or 2009? Feel free to leave your answers in the comments and read the full letter from President Coffman as well as the details about the clinical framework at the University in 1926 below. If you work within earshot of a functioning intercom speaker in any of the health sciences facilities, you will recognize the implications of the above alert. The wind gusts through the tunnel area between the Malcolm Moos Health Sciences Tower (Unit A) and the Philips-Wangensteen Building (Unit B/C) has the power to stop you in your tracks, push you back, and quite possibly knock you over. It does not take a particularly windy day to create this effect. In fact, the narrow space within this cluster of buildings amplifies any sustained wind. The force of this unintentional wind tunnel became evident after the completion of the Philips-Wangensteen Building in 1979. Shortly thereafter, concerns developed about how the problem might be aggravated by the next phase of planned construction: the new hospital (Unit J). Two major fears were that the new hospital would increase the wind shear at the pedestrian level or may cause a downward draft bringing chemical fumes vented from the roof tops of the Mayo Building and Diehl Hall. 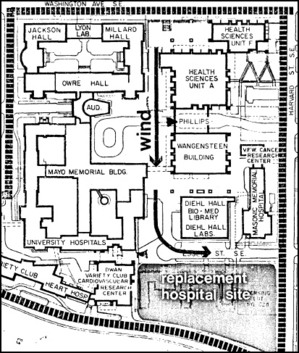 After a wind related “incident” in January of 1980 at the outpatient entrance on Delaware St., a memo suggested the need to evaluate the extreme wind conditions and to develop a plan to minimize the risks. That memo led to a 1981 study of the wind tunnel effect at the Wright Brothers Wind Tunnel Lab at the Massachusetts Institute of Technology. 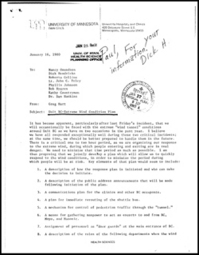 The 1980 memo and subsequent documentation on implementing the wind tunnel study are available below. Or, read the final technical report issued by the WBWT in 1982.